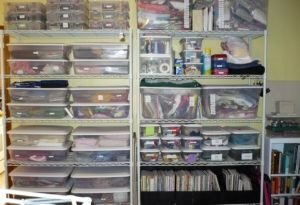 I have no idea how much stash I have, although I do know where it all is. This picture was taken several months ago. There is a bit more on the shelves now. About all I completed was 2 12″ Flying Dutchmen blocks for a block lotto. You don’t really want to know how much stash you have, since it’s probably two or three times what you thought. Good job on starting with positive numbers! Don’t worry about what you start with, think about what you’re going to finish!